Truck accident on bridge A cement truck and semi-truck crashed on the bridge over the Green River on Highway 351 Wednesday, leaving the truck's belly dump perched over the guardrail. The highway was closed for several hours as crews cleared the wreckage. The drivers were transported by ground ambulance to the hospital in Jackson. Semi-truck cab The cab of the semi-truck, after it had been moved off the bridge and pulled to the side of the road on the west side of the bridge. Trailer on bridge rail The truck's trailer came to rest over the bridge guardrail. Editor's Note: Information in this report is still unofficial and preliminary, based with talking with people at the scene of the accident Wednesday. We'll post official information to update this story when it becomes available. An accident between a cement truck and belly dump semi-truck on the Green River bridge closed US Highway 351 east of Big Piney for several hours early Wednesday afternoon, October 18. 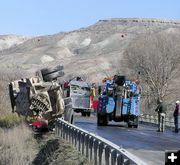 According to unconfirmed reports, the two vehicles were passing each other on the narrow bridge over the Green River around noon when a tire blew out on the cement truck, causing it to crash into the belly dump truck. The collision and impact caused the belly dump semi-truck to tip over. The trailer separated from the cab and ultimately came to rest perched on the railing on the north side of the bridge. The cement truck came to rest on the other side of the bridge. Neither vehicle went completely over the rail into the river. It is not yet known how many people were in the vehicles or the extent of their injuries. Preliminary, unofficial reports are that the two drivers were transported by ground ambulance to the hospital in Jackson. Traffic was stopped for several hours in both directions as the cement truck and wreckage of the semi cab were removed from the bridge. The road remained closed while crews washed cement from the bridge, cleared debris, and waited for heavy winch trucks to arrive to remove the wrecked belly dump trailer from the bridge guard railing. Highway 351 is a major access road to and from the Jonah Field and Pinedale Anticline natural gas drilling fields and receives heavy truck traffic. Sublette County Sheriff’s Office, Big Piney/Marbleton volunteer fire department, Sublette County EMS ambulance, Sublette County Emergency Management and Wyoming Highway Patrol all responded to the scene. Belly dump on bridge railing The belly dump trailer wreckage. Truck cab Truck cab after it had been moved to the west side of the bridge off the road. Truck cab Cab of the belly dump semi-truck after it had been pulled off the bridge to the west side of the highway. Washing cement off bridge A Wyoming Highway Patrol officer took measurements after crews washed cement from the bridge and roadway. The cement truck is on the opposite side of the bridge on the left. Winch trucks arrive Two winch trucks pulled the belly dump trailer off the guardrail. Emergency vehicles Big Piney/Marbleton volunteer fire department, Sublette County EMS ambulance, Sublette County Sheriff, Sublette County Emergency Management, and Wyoming Highway Patrol responded to the accident. Traffic backed up The accident backed up traffic in both directions on Highway 351 for several hours early Wednesday afternoon. Belly Dump The belly dump semi-truck involved in the accident was similar to this one. Bridge approach The highway curves on the bridge approach from both directions, creating short sight distance. The approach, narrow bridge, big game wildlife crossing and icy conditions in the winter make this a very hazardous bridge crossing with the heavy truck traffic this highway now receives.